Nearly 12 months ago I came across a copy of ‘The International’. 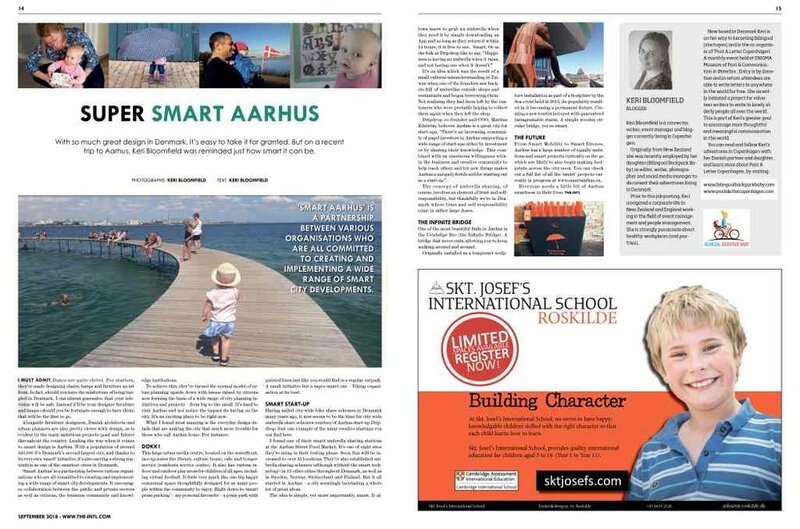 An independent Danish newspaper written in English full of real and entertaining information aimed at helping international residents in their adjustment to life in Denmark. I liked it. A lot. So I reached out to the Editor, the ever so lovely Lyndsay, who gave me the opportunity to be part of her team sharing some of my experiences and advice for living in Denmark. Since then I’ve had fun writing and sharing our ‘wisdom’ with a dash of humour, about life in Denmark. So, I thought I’d group them all together in one place for easy reference. Whether you live in Denmark or not, I hope they give you a little slice of understanding of what it’s like to be an International living in Denmark. Enjoy & let me know what you’d like me to write about in 2019! They say it takes a village to raise a child, but what if its not your village? With one of the worlds most sophisticated cycling infrastructures, Denmark is one of the best countries to be a cyclist in. But it can also be one of the most intimidating. One of the best things about living in a new country can be escaping it. And in this case we escaped to the birthplace of IKEA, just 2.5 hours from Copenhagen. July is the month when Dansk jordbær (Danish strawberries) are in plentiful supply. A true taste of summer that shouldn’t be missed. Faellesspisning, a Danish communal dining experience, has become increasingly popular in Denmark over the last few years. A unique way to share a meal that welcomes everybody and is creating colourful dining rooms all over the country. With so much great design in Denmark it’s easy to take it for granted. But Denmark’s second biggest city has a full extra tricks up its sleeve. Whilst most Danes are seemingly ‘born on a bike’, embracing the cycling culture can often be a challenge for new residents and visitors to Denmark. In this article we share several ways you can share the cycling culture with your next set of visitors. Whether it be using public transport, naming your child or parking your car, Denmark has a few rules worth knowing about. Rules which are normally diligently observed as a result of the hefty fines and penalty fees incurred if broken. In terms of hygge, Christmas in Denmark is when it reaches its peak. So, buckle up, grab an advent candle an æbleskiver pan and look out for the arrival of an elf named Nisse.